Back when I didn't wear a white coat most days, you were more than likely to find me wearing a scarf between the months of October and April. I just love having something warm around my neck, and I find it's the easiest (and comfiest) way to complete an outfit in the colder months. Now that I wear my white coat, I don't wear scarves during the week as often, but still wear them all weekend long. 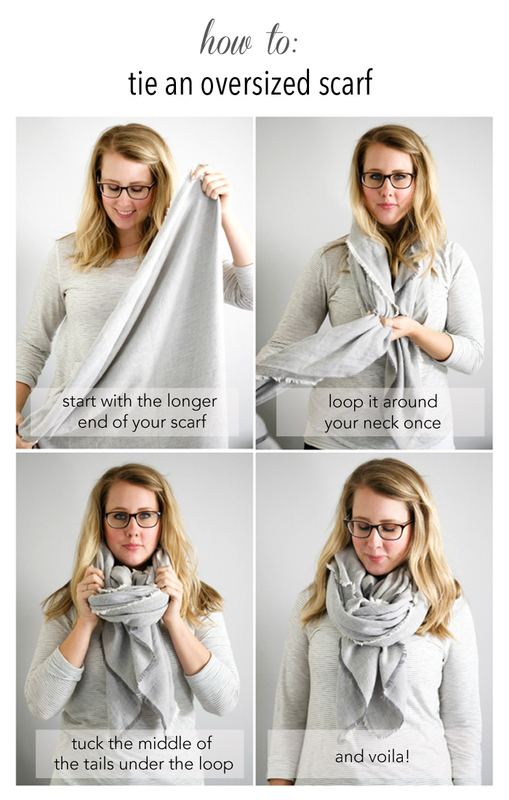 How I tie my scarves is one of my most frequently asked questions, so today I'm sharing alllll the secrets. It's really not difficult at all - it's actually stupidly simple. The real secret is finding the right kind of scarf. While blanket scarves are still the scarf du jour, I really prefer oversized scarves - the fluffy kind that are warm and comfortable, but don't take over your entire body. Mine above is from Ann Taylor, and is the perfect example of what I'm talking about. Similarly, my tan scarf from Nordstrom is also the perfect size. To tie your scarf, hold it at one corner of the scarf - this stretches the scarf to its longest length, and makes it so your ends won't be as bulky. Loop it around your neck once, so that the ends are even on both sides. Then take the top half of the tails and tuck it up into the loop. That's it!